This agreement is designed for use by the owner of land who wishes to grant sporting rights over it for one or more guns. The agreement is designed for use where the licensee is an individual or a syndicate, or group of individuals. This Agreement is designed for use by the owner of land who wishes to grant sporting rights over it for one or more guns perhaps in a syndicate. It is not suitable for the grant to a company due to other issues arising. 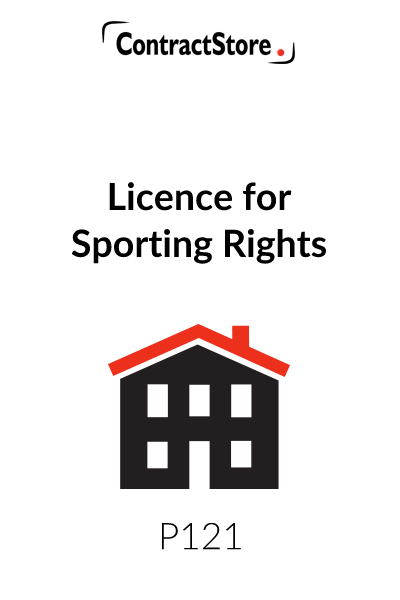 The rights are granted by way of an exclusive licence giving permission for entry onto the land for the purposes of the sport. It is really designed for use for a single shooting season, but it could be modified to apply to a shorter period. The Agreement also permits others authorised by the Licensee to shoot provided that they are accompanied by the Licensee. There are also provisions for a gamekeeper to be appointed. There are detailed Schedules setting out the rights and obligations of the parties. 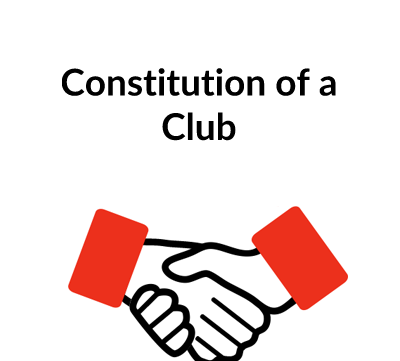 The Agreement may require some modification to suit the particular set of circumstances. The full names of the Licensor should be given at the beginning. If there is more than one, then all names should be given. If it is a company, then its full company name and its registered office should be given. The full names of the Licensee should also be given. There may perhaps be more than one with them all in a shooting syndicate. In this event, all names should be given. Only those named will be able to shoot on their own. Any others authorised by the Licensee under clause 2.5 will have to be accompanied by the Licensee. 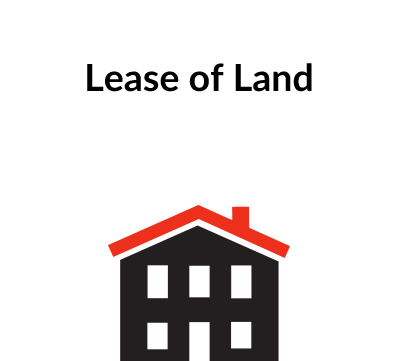 The reference to “Adjoining Land” should be retained even if there is none as it is possible that the Licensor may acquire such land later when the Agreement is still in operation. You may want to amend the distance of 250 metres for determining the extent of this land. The “Land” is the land over which the rights may be exercised and you will need to complete the description in Part 2 of the Schedule. It will probably be best to refer to a plan as well so that the extent of the Land is clear and, if so, then a copy of the plan should be attached to the Agreement. The “Licence Fee” is the single amount payable by the Licensee for the duration of the Licence, whether this is to be paid as a single sum at the beginning or by instalments. The “Licence Period” should refer to a specific period of time. It may be that the Licence Period is to start on a future date rather than on the date of the Agreement. Alternatively, if it is a past date, then it will be necessary to alter the words under “Background” to say that the Agreement records the terms which already apply to the Licence. Also, the Licence Period may run from a date before the beginning of the season as the Licensee may want time to rear game on the land and get everything ready for when the season begins. 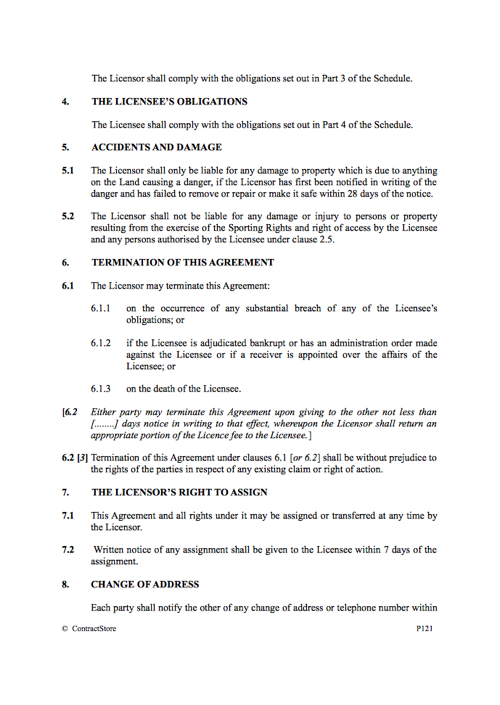 This clause sets out the grant of the rights to the Licensee and those which are reserved to the Licensee. A right of access to the Land has been included, but this can only be included if the trackway is owned by the Licensor. On the other hand, access may be from the public highway or over public rights of way and, if that is the case, then this clause should be deleted along with the references to the right of access in other parts of the Agreement. There is also a right for a gamekeeper to enter the Land if paragraph 10 in Part 4 of the Schedule is included. These are set out in Part 3 of the Schedule. The basic obligations have been included, but you may want to include others depending on the type of land and the operations of the Licensor being carried out on it and on any land nearby. These are set out in Part 4 of the Schedule. Some of the obligations may not apply and you may want to add others. There is a reference to a gamekeeper on the basis that the Licensee will be responsible for the game. On the other hand, perhaps the Licensor is to be responsible for ensuring that there is game on the Land ready for the guns. You will need to refer carefully to the relevant insurance policies of both parties to make sure that all usual risks arising under the arrangements between the parties are covered. This clause may then have to be amended to suit the case. The Licensor may well be liable for injury to people on the land, particularly if there is some danger for them other than one arising from the sporting rights being exercised. In the ordinary way, the Licence will continue until the end of the Licence Period. However, it will come to an end on the happening of any of the events referred too in clause 7.1. In addition, the parties may want to include clause 7.2 so that either party can end the Agreement earlier. The Licensor may, for example, wish to sell the Land to a party who wants to keep the sporting rights. 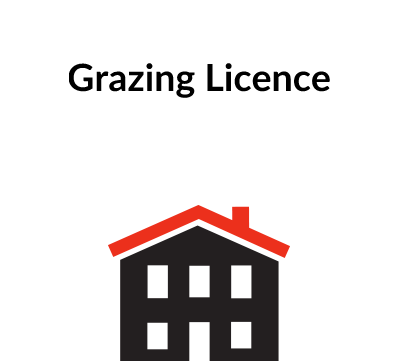 The Licensor may wish to sell the Land to a purchaser who is happy with the Licence and so the Licence can be assigned to the purchaser under this clause. The Agreement should be executed by the partiers and dated as soon as they have finalised all the terms even though the Licence Period is to start at a future date.